Suri Fernandez was born and raised in Miami, Florida. Suri graduated from Florida International University with a Bachelor’s degree in Health Services Administration in 2004. She then completed her Certified Veterinary Technician degree and certification from St. Petersburg College in 2008. Since 2000 she has worked in several practices ranging from general practice, emergency and specialty medicine. She also works with a mobile vaccine clinic to provide accessible, affordable care to pets. Suri has given back to her community by volunteering her time with several rescue organizations and has fostered and nursed sick pets back to health and found wonderful loving homes for them. When she is not helping pets in the community she enjoys running, crossfit and Bikram Yoga. Suri is very passionate and ethical about her work and is very committed in providing the best medical care for all patients. Aside from providing relief service to veterinarians, she also offers at home pet sitting service, assists in non-anesthetic dental cleanings, provides pet transport, and at-home medical care for sick or post surgical patients. Michelle Thomas graduated with honors from Michigan State University in 2005 with a bachelors’ degree in veterinary technology. It was here she interned with a holistic veterinarian and it sparked her passion for natural medicine and care for pets. Since then she has dedicated herself to the study of a more natural approach to pet care, this has included two years of study of Traditional Chinese medicine and Herbs. 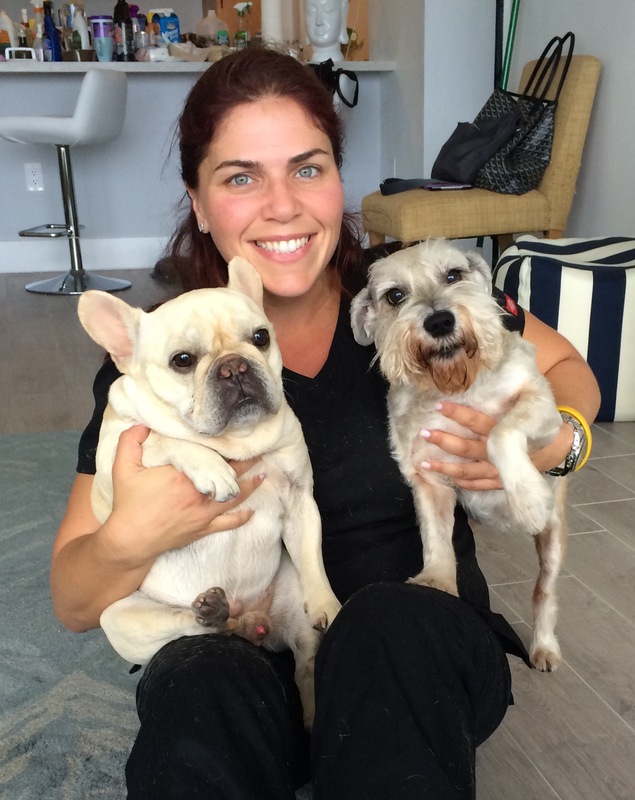 Michelle moved to Miami five years ago and loves her job at Miami Natural Pet Care where she can enjoy the beautiful weather walking dogs. She has a great heart for animals and treats clients animals with the same affection and care she does her own. Francesca who is already an animal lover like her mom. Justine Parry has been working as a veterinarian technician for over nine years and has been an animal lover all of her life. Raised in France, she was already involved in her country with volunteering in animal shelters, rescuing and fostering dogs and cats. She decided to pursue this vocation when she moved in Miami in 2005. She worked in a veterinary clinic while studying in the veterinarian technician program. During this program, she followed clinical rotations in well-known animal hospitals such as Knowles and Hollywood Animal Hospital. She passed the national and state exams and became certified in 2007. She always has held a specific interest in dentistry and followed many continuing education programs about it. She attended a dental seminar with Dr. Bellows a prestigious veterinary dental specialist. Today she’s still working in a small animal hospital and lives in North Bay Village with her family including her 6 years old maltese and her 12 years old cat. She has performed many dentals with or without anesthesia.